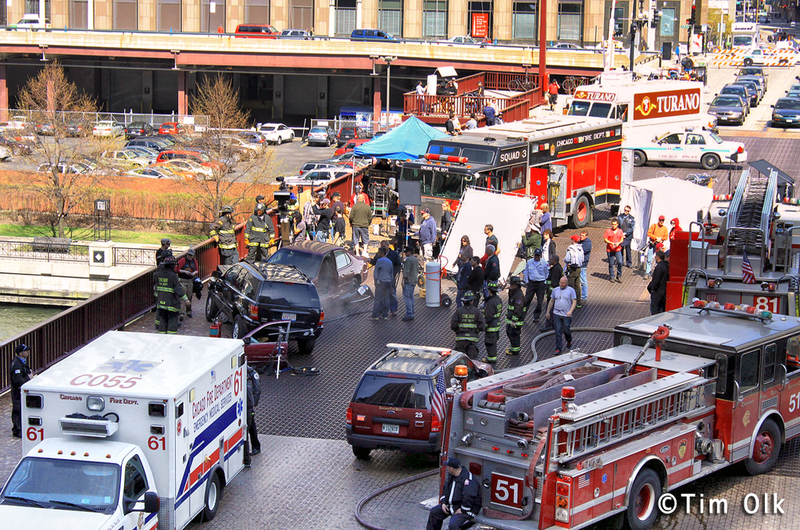 The Battalion 25 buggy being used in the show Chicago Fire is a 2003 Ford Explorer, shop #B-490. 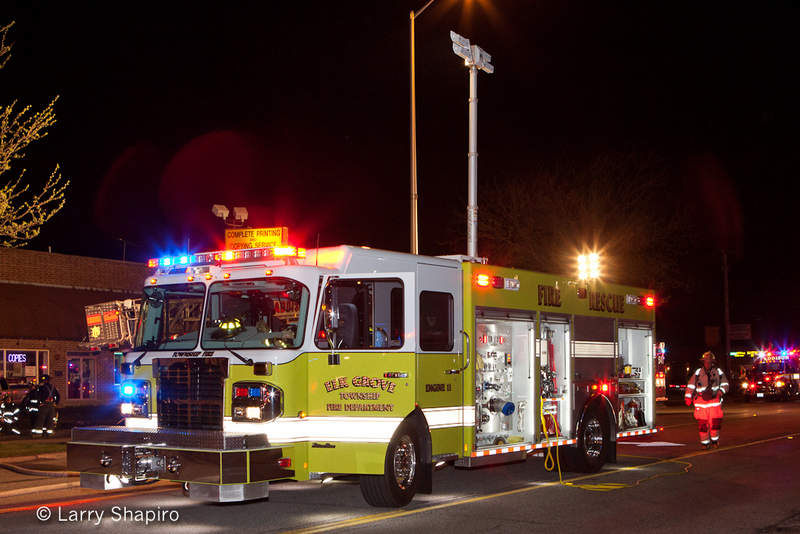 This was formerly assigned to the Fact Team, which was an EMS team that would go to special events. 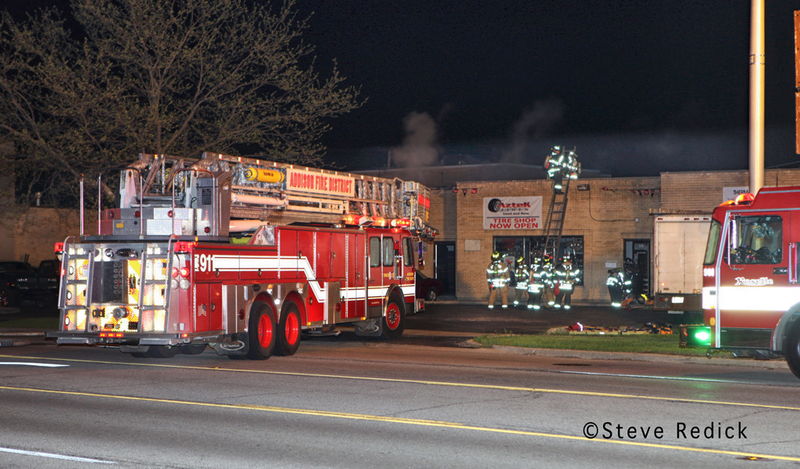 Dolton FD had a Box Alarm this morning around 0630-0700 at 300 Sibley Blvd. 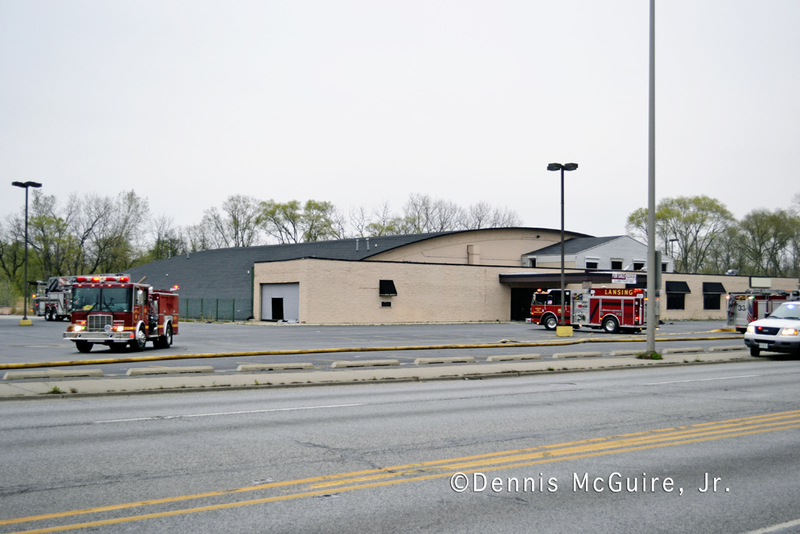 It was a large vacant building 200×200 with a bow string truss that had been used as an entertainment center. 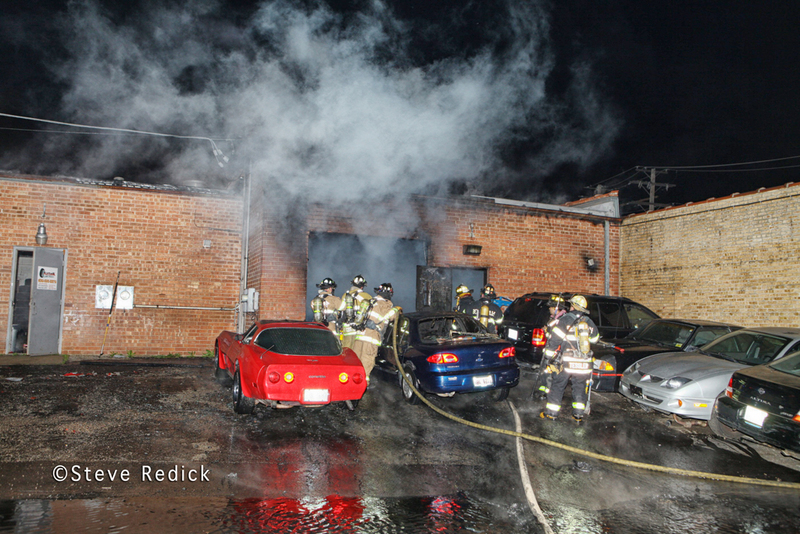 A Buds Ambulance crew noticed smoke coming from the building and called it in. 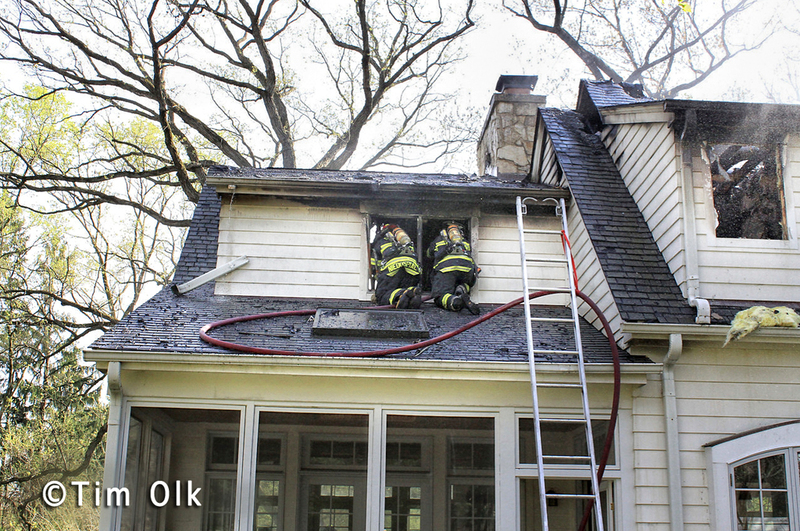 A Dolton engine got on-scene and found fire thru the roof in the rear. 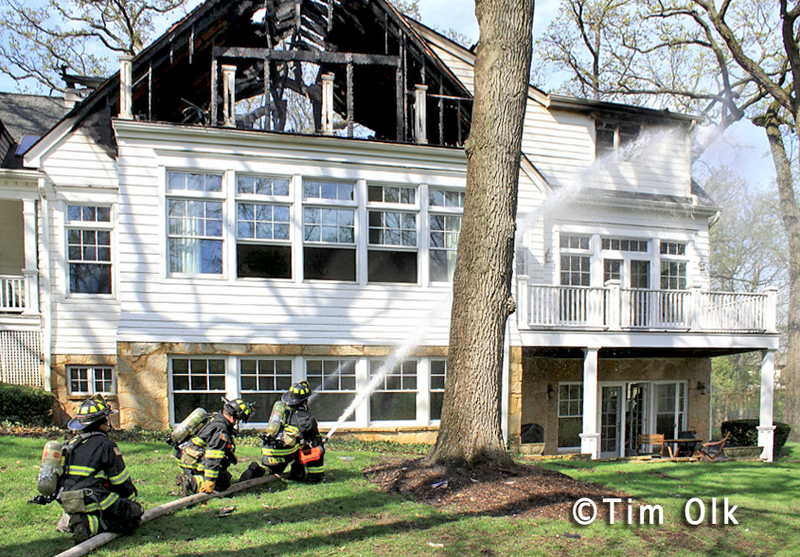 Upon entry the crew went to the 2nd floor and found fire in a room and in the walls on the interior. This 2-story area was built inside the open area of the building. 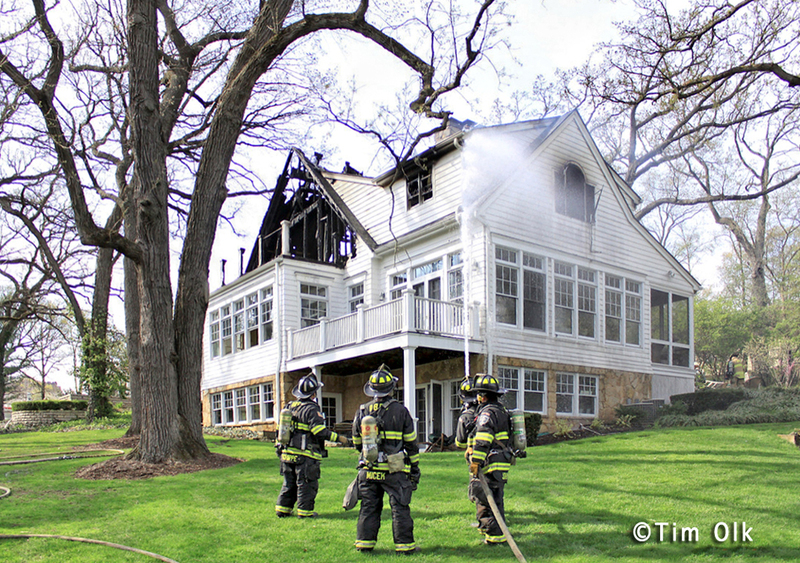 A good knock kept the fire from spreading to the rest of the heavy timber building. 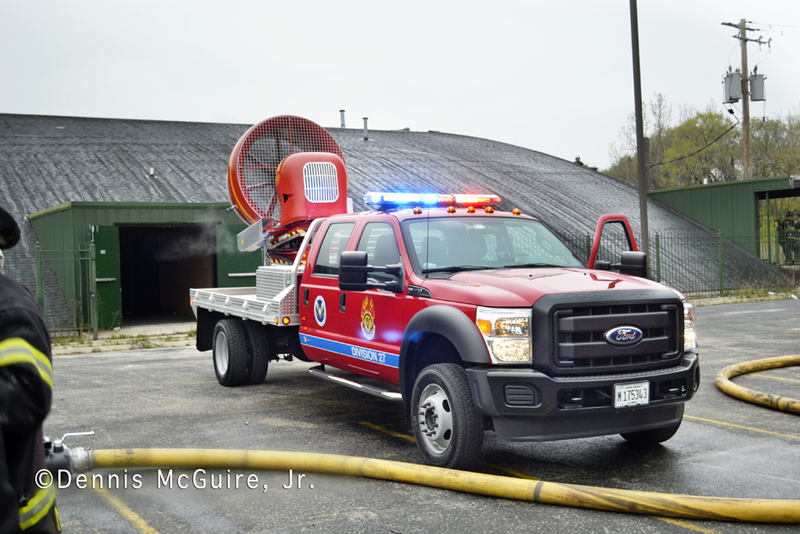 MABAS 27 MVU was special called to vent the heavy smoke conditions in the open floor area in the center of the building. I got there after the fire was knocked. This building had been built as a Model City Food grocery store. 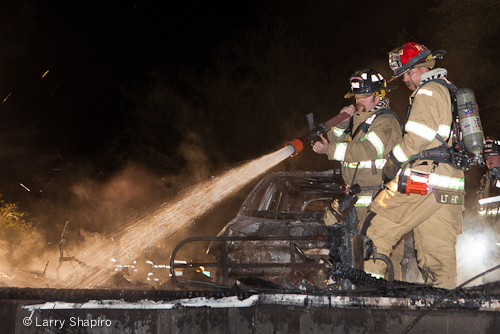 Steve Redick submitted several additional images from the 2nd Alarm fire in Wood Dale Thursday night. 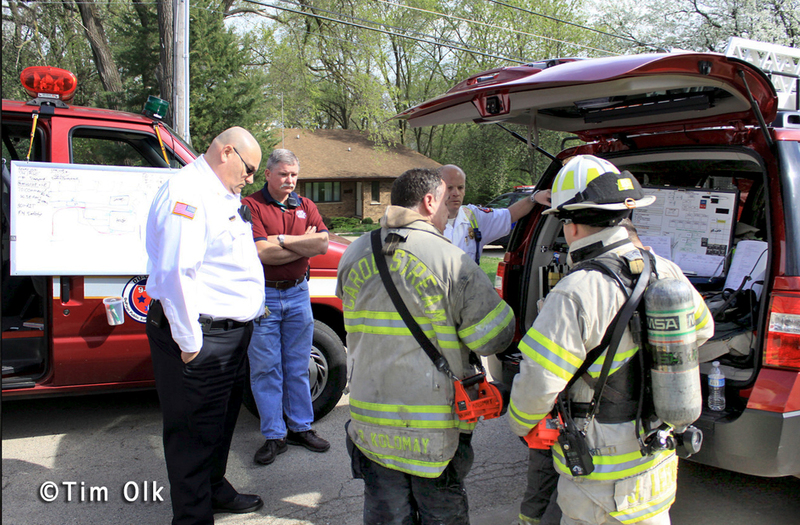 The Carpentersville Fire Department has a new ambulance on order. 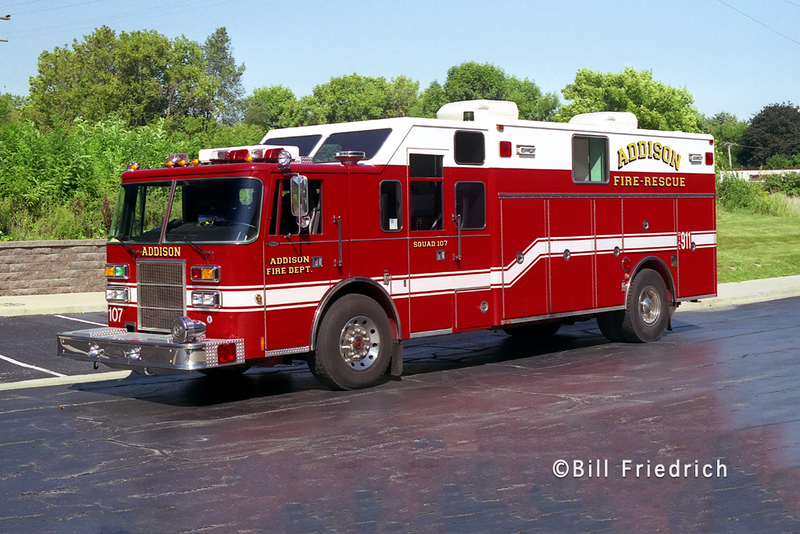 They purchased a Type I unit from Medtec on a Freightliner Business Class chassis. 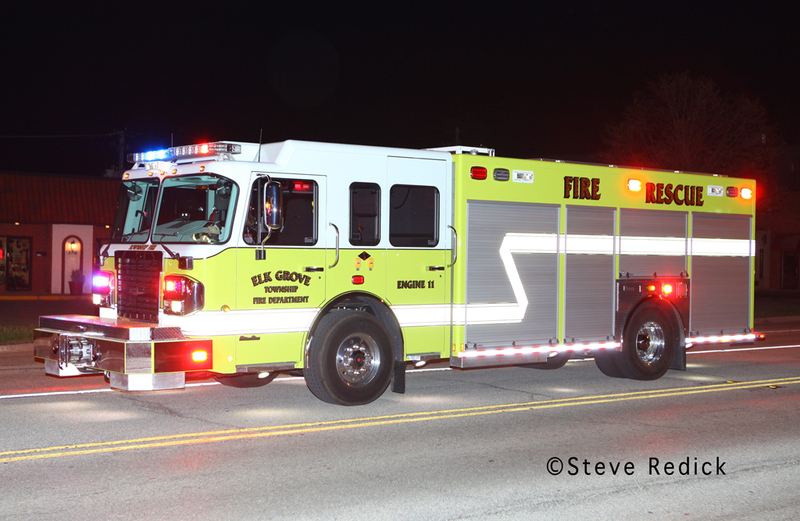 The Palatine Rural Fire Department has ordered a Type I Horton ambulance on an IHC Terra Star chassis. 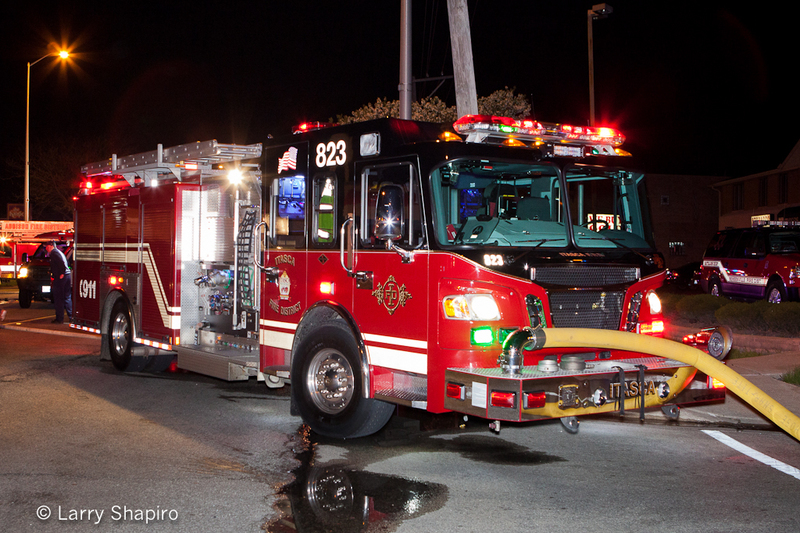 The Wauconda Fire District has a Type I Medtec on a Freightliner chassis coming in October. 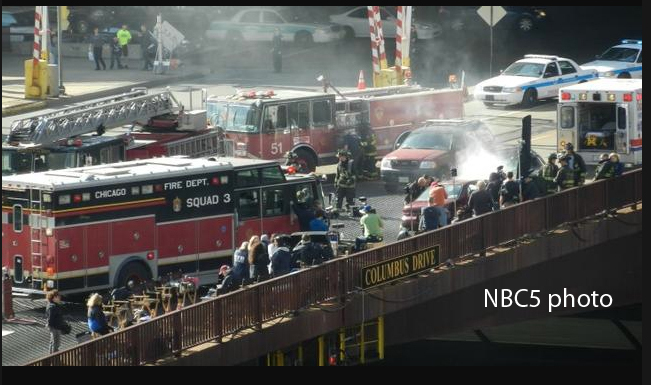 One of our readers found a link to an NBC article on the filming of Chicago Fire that includes a gallery of images from the Columbus Avenue scene this week. 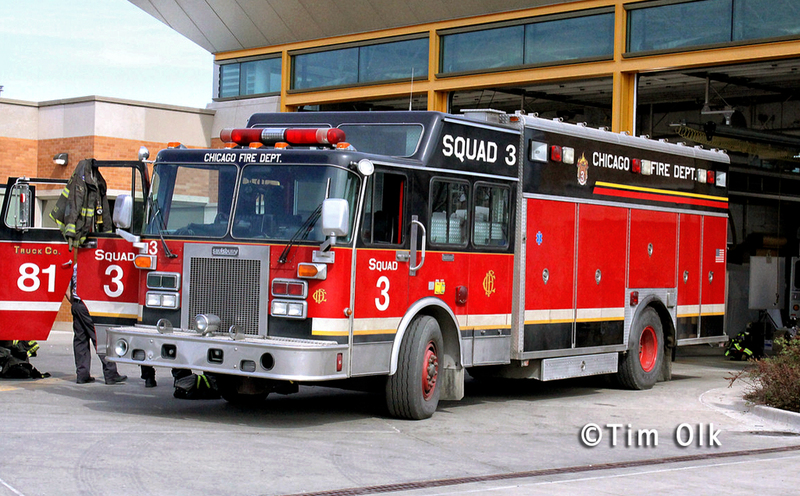 Looking at the photos will answer several reader questions that have been posed about the apparatus being used as Squad 3 with an unconventional … unique color scheme. Also there is a large blue stripe that has been added to the ambulance. 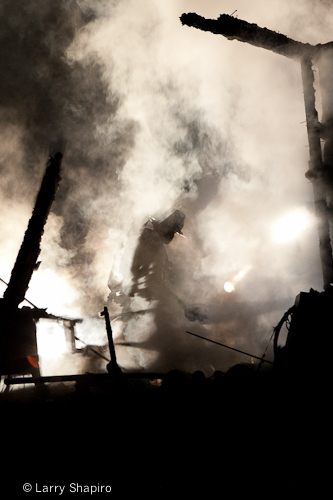 Tim Olk submitted images of the three suppression rigs being used for the show. 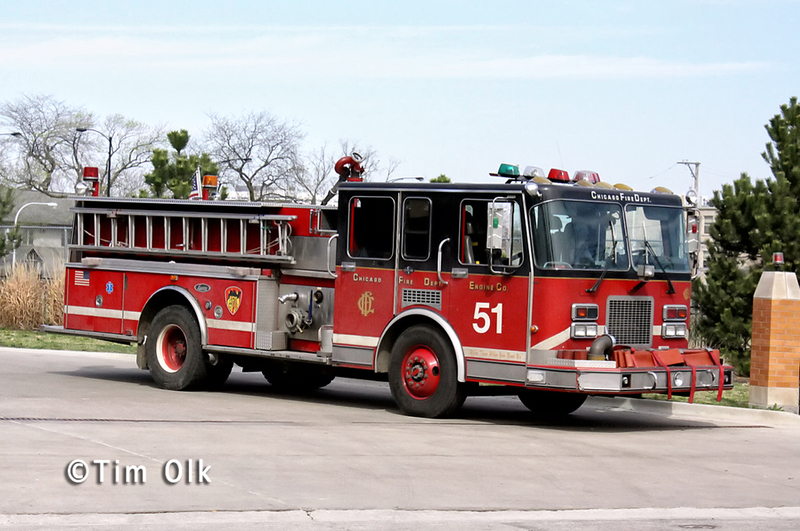 Squad 3 is obviously the spare haz mat (G-492, 1989 Spartan Gladiator/Saulsbury) but the shop numbers have been removed from the engine (1995 Spartan/Luverne) and the truck 1995 or 1996 Seagrave). 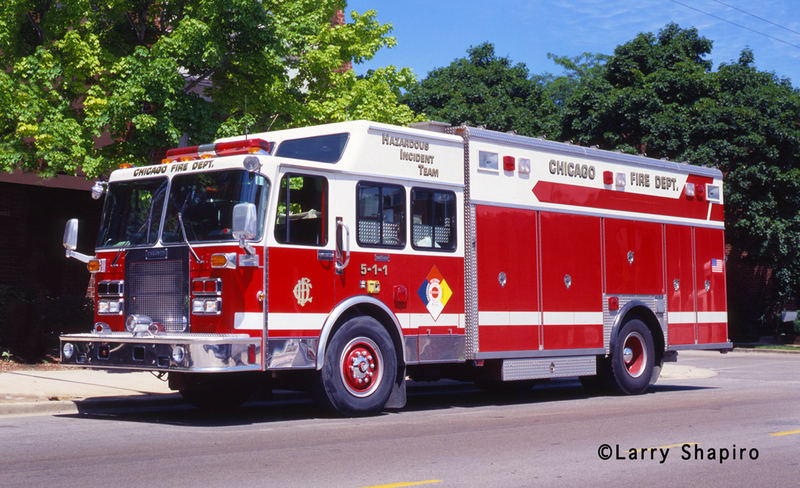 The Ambulance carries shop #C055 which is a 200 Ford/MedicMaster (American LaFrance) that had been assigned to Ambulance 47. 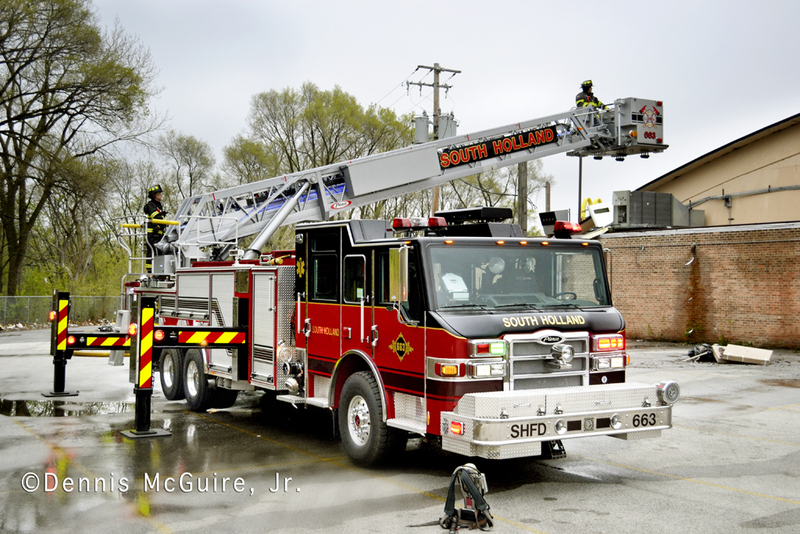 Check it out the NBC5 article HERE. 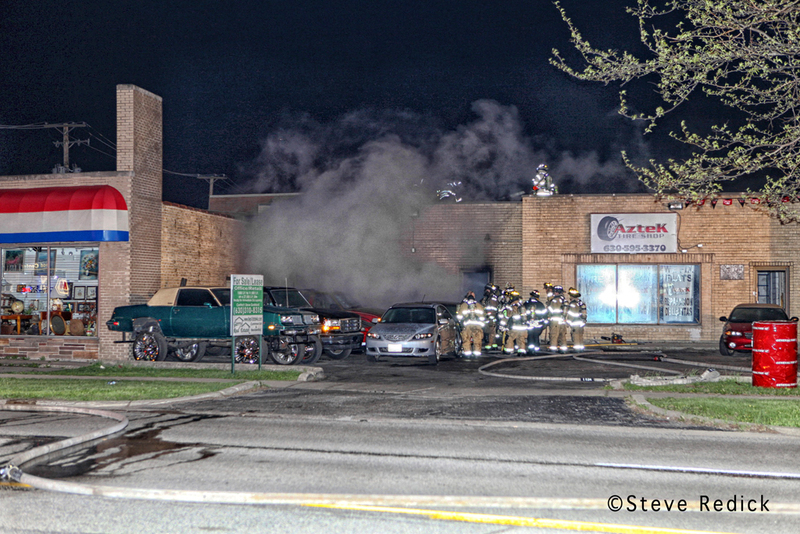 Wood Dale companies responded to a commercial fire Thursday evening at an auto repair shop at 370 E. Irving Park Road. 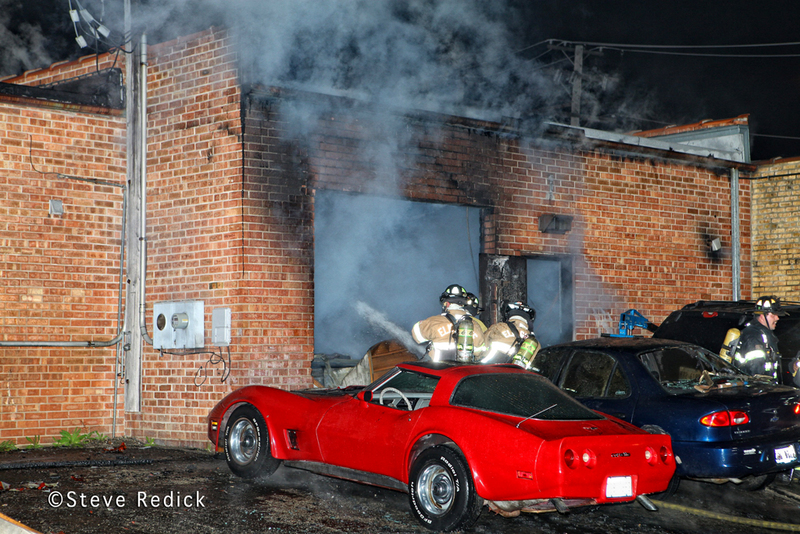 They found heavy fire with flames through the roof on arrival in a one-story brick building with buildings on either side. 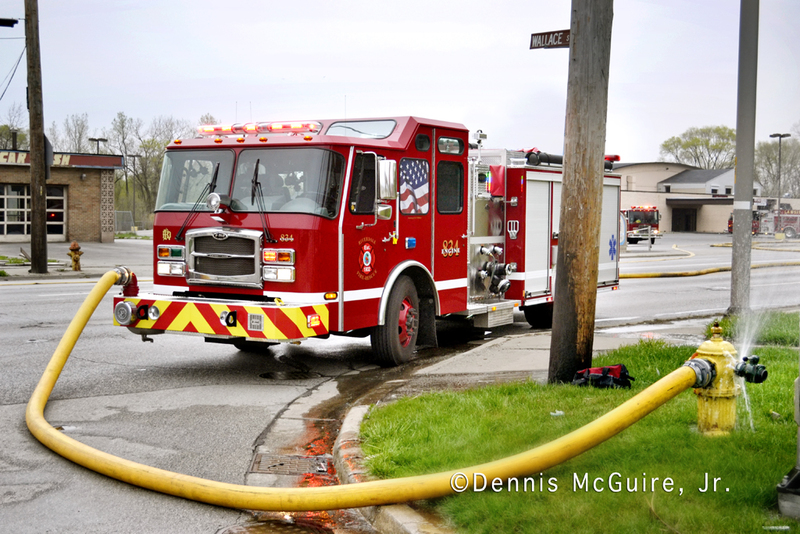 Engines from Itasca and Bensenville were on the initial alarm with Bensenville Battalion 17 and an Addison truck. 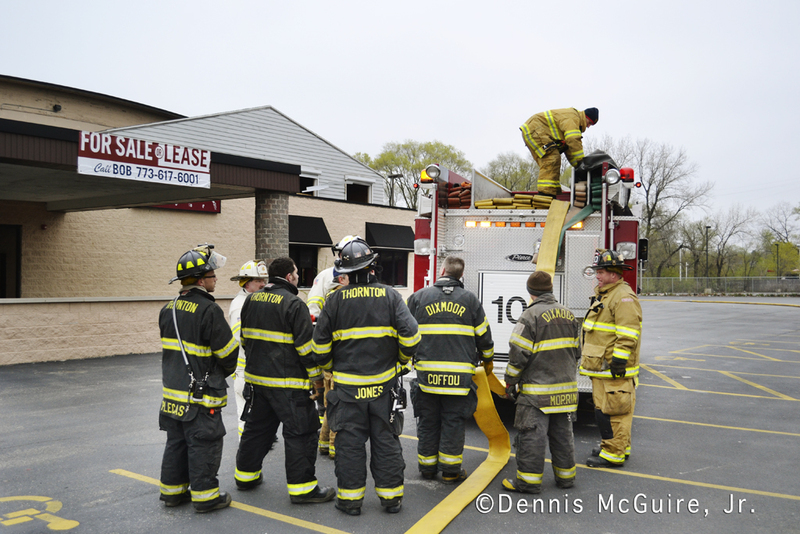 A Box Alarm was requested immediately which brought additional companies from Elk Grove Village, Roselle, and Elmhurst. 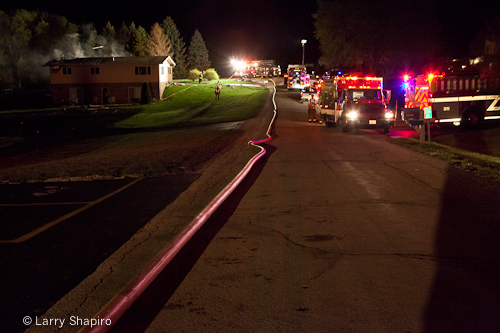 Roughly a half hour into the fire a 2nd Alarm was requested bringing additional units from Schaumburg, Hanover Park, Elk Grove Township, and Bloomingdale. 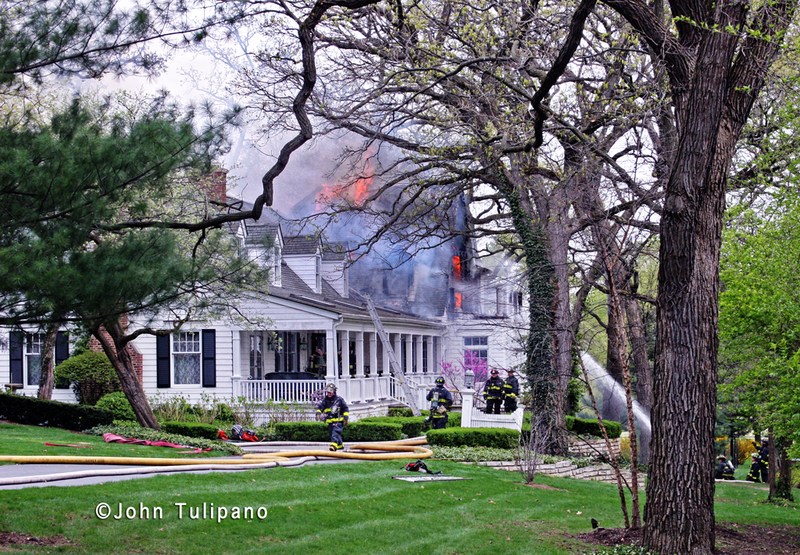 A large house fire in Glen Ellyn went to three alarms Tuesday afternoon. The house had a long driveway and many trees which complicated access. 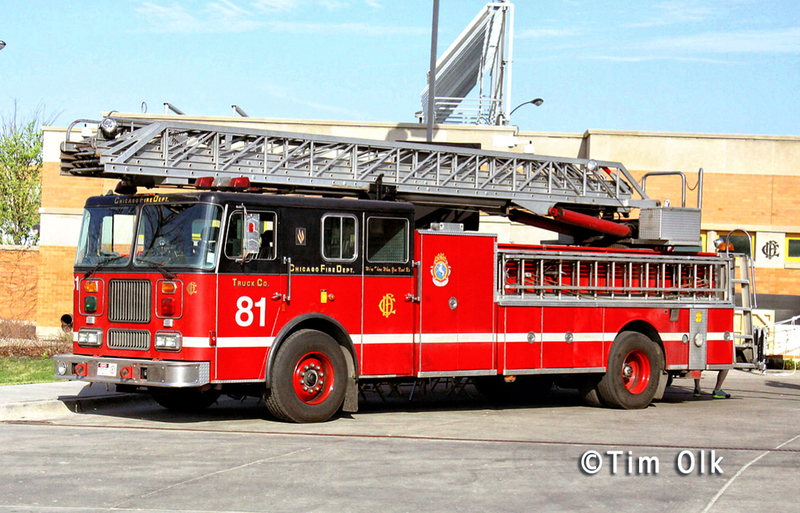 Articles with photos can be found HERE and HERE. 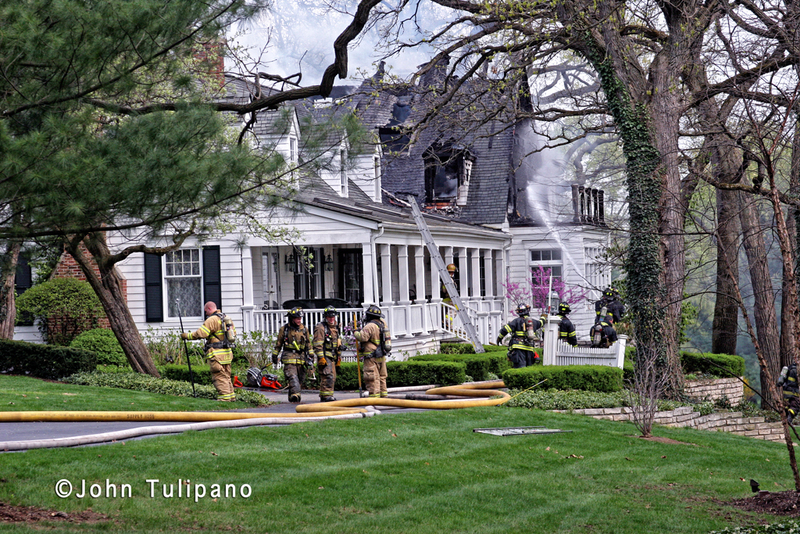 John Tulipano sent in two images from the scene. He has more photos HERE. 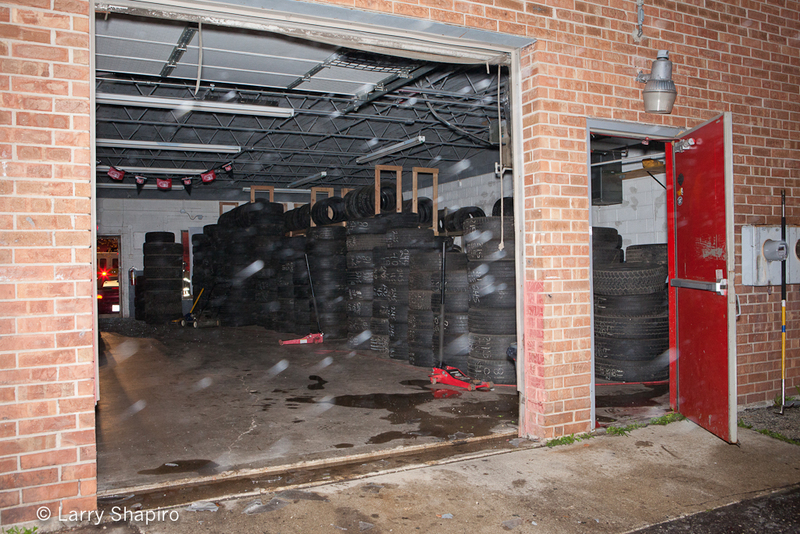 Tim Olk was also at the scene and submitted several images. He has a gallery HERE. 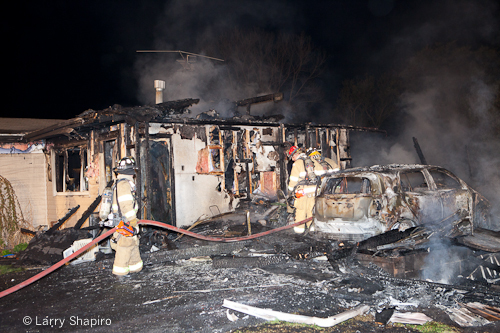 The house sustained extensive damage after the fire was knocked down. John Tulipano photo. 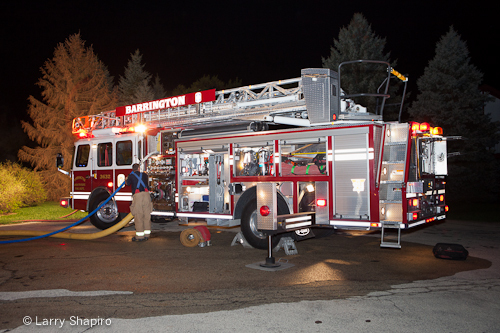 The Barrington Fire Department received a call from residents reporting fire in the garage of their home at 23170 N. Church around 9:30PM on Wednesday. 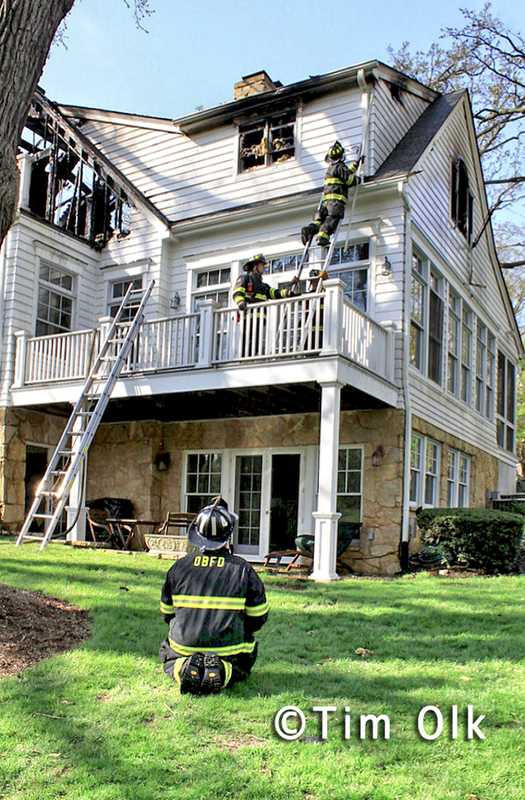 When the first unit which was Barrington Engine 363 arrived on the scene, they found a well-involved garage fire attached to the house. 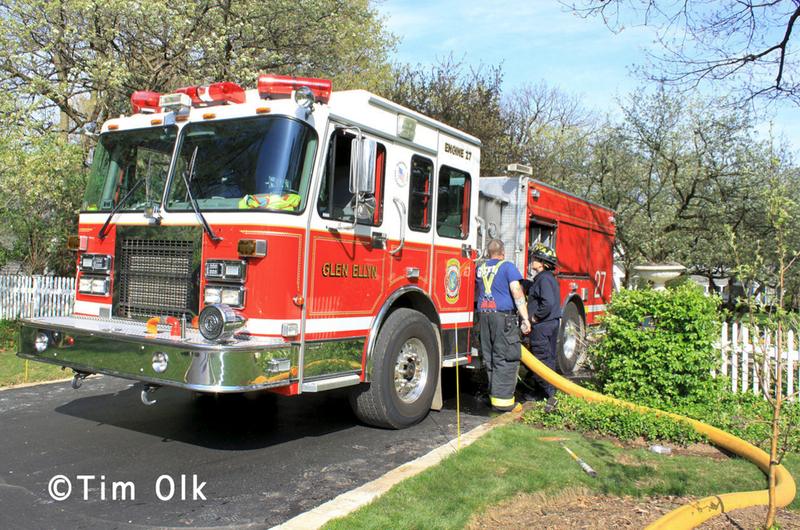 They were followed almost immediately by Lake Zurich Engine 2 who made a u-turn in the dead-end cul-de-sac and laid 400′ of 5-inch supply line to the corner. 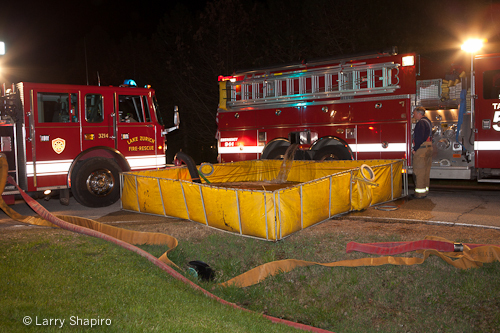 One of Barrington’s tankers dropped their portable tank and the water supply was established as companies went to work advancing two lines through separate doors of the house. The building was constructed on a hill with one-story in the front and two-stories on the side. 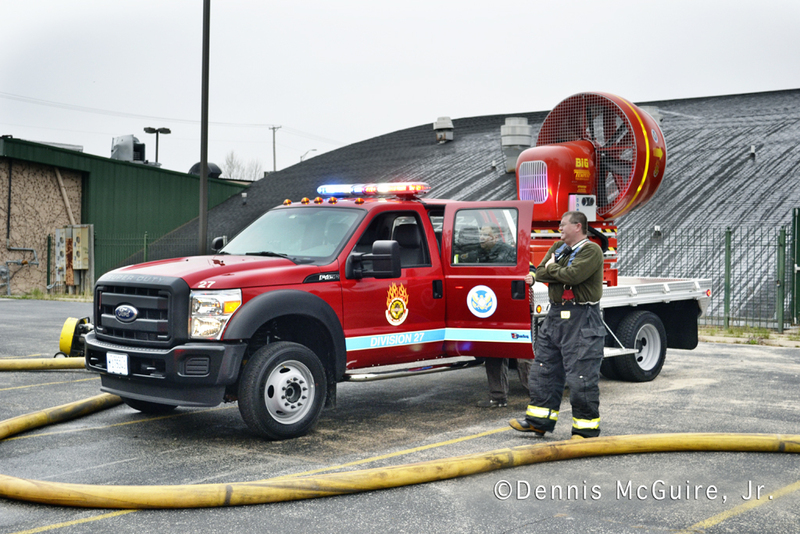 Barrington requested a MABAS Box Alarm later which brought tankers from Wauconda, Fox River Grove, and East Dundee to supplement the two Barrington tankers and Long Grove Tanker 55. 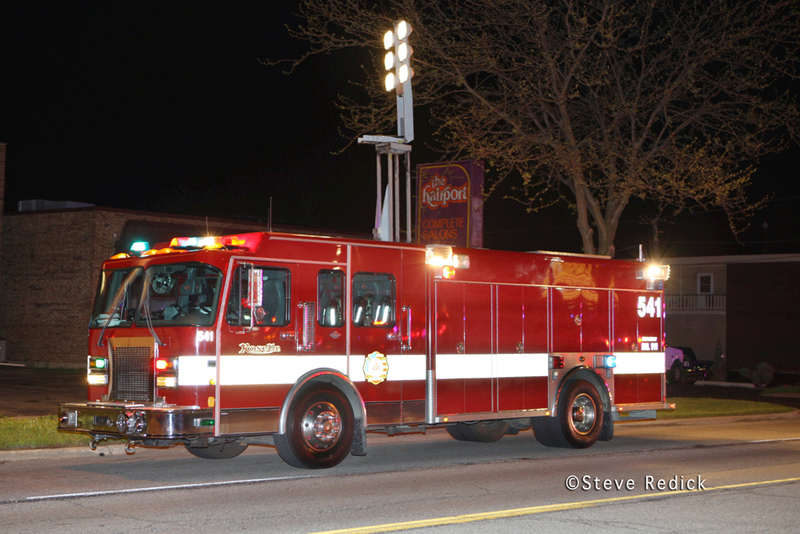 Palatine responded with Truck 85 and engines came from Hoffman Estates, Palatine Rural, and Carpentersville. 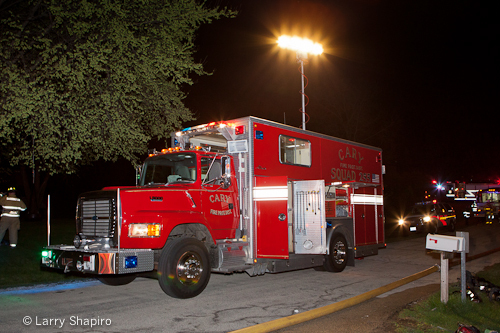 Rolling Meadows filled in for a company that was not able to respond with an ambulance, and Cary Squad 255 was on-scene implementing a light tower for scene lighting. 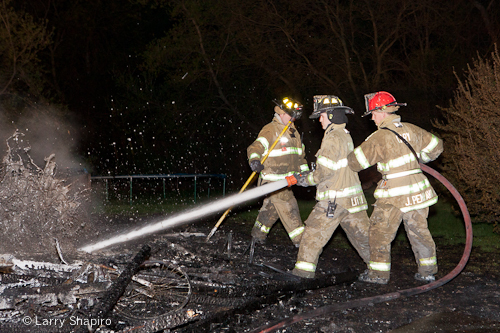 Chief officers came from Long Grove, Wauconda, and Carpentersville. 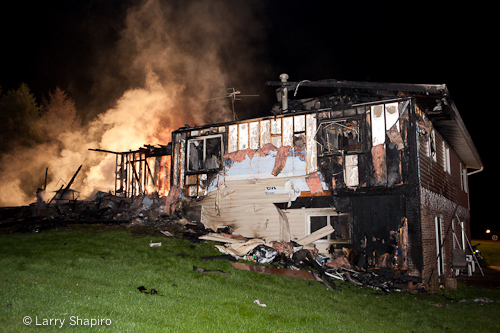 The family dog perished in the house but all residents evacuated safely. 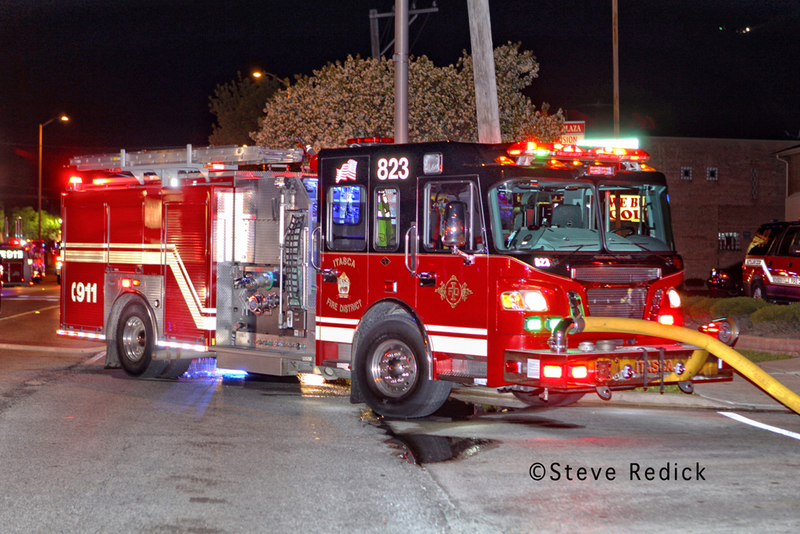 The Box Alarm was struck out shortly after 10:30PM. 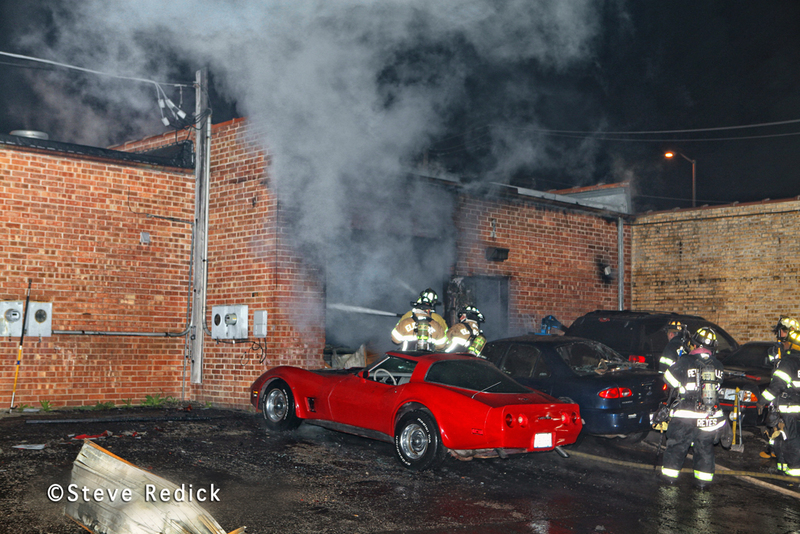 Larry Shapiro arrived at the scene after the fire was extinguished and submitted these images. 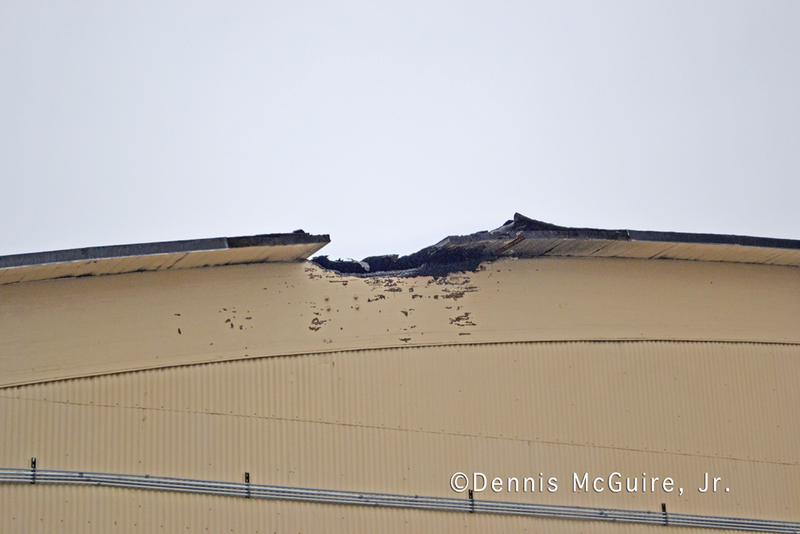 More can be viewed HERE. 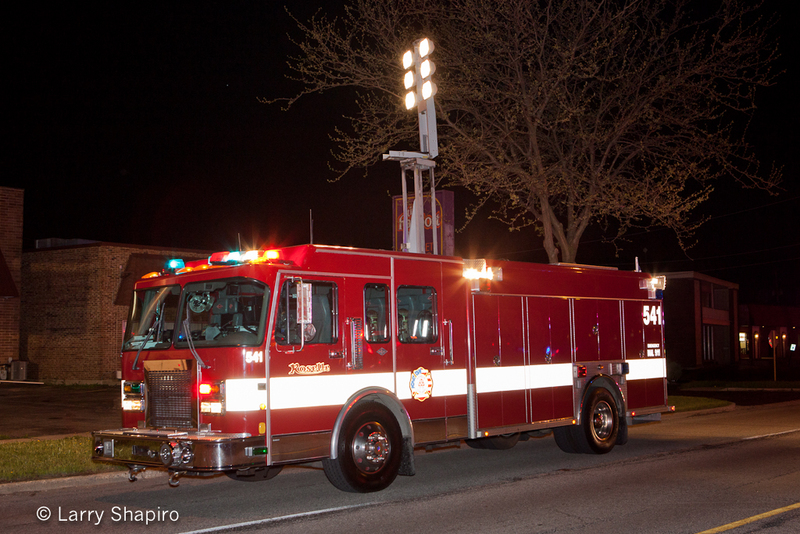 The Chicago Tribune has an article HERE about a crash involving 4-5-6 and a three vehicles about 9PM Wednesday night near 95th Street and Stony Island. 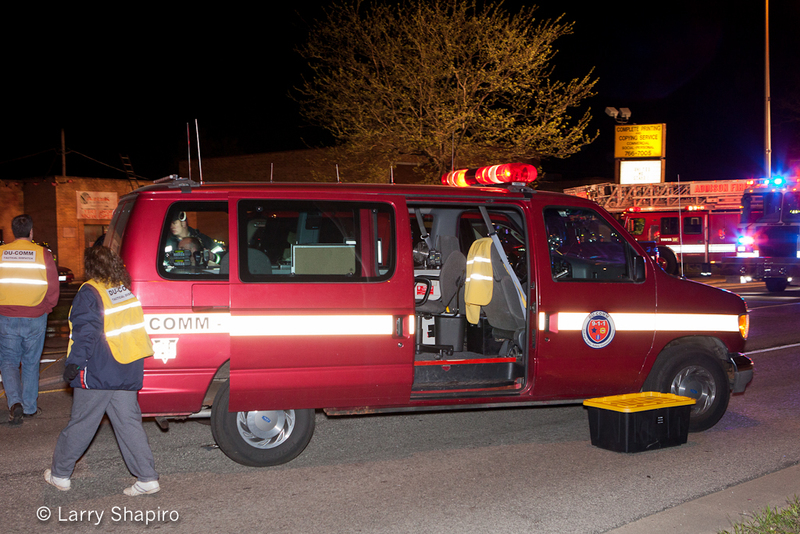 The unnamed chief was headed toward a fire in the 9200 block of Greenwood Avenue when he was struck by another vehicle as he traveled through the intersection at Stony Island, said Fire Department Chief Joseph Roccasalva. The chief was rushed to Advocate Christ Medical Center in Oak Lawn in serious-to-critical, but stable condition, Roccasalva said. 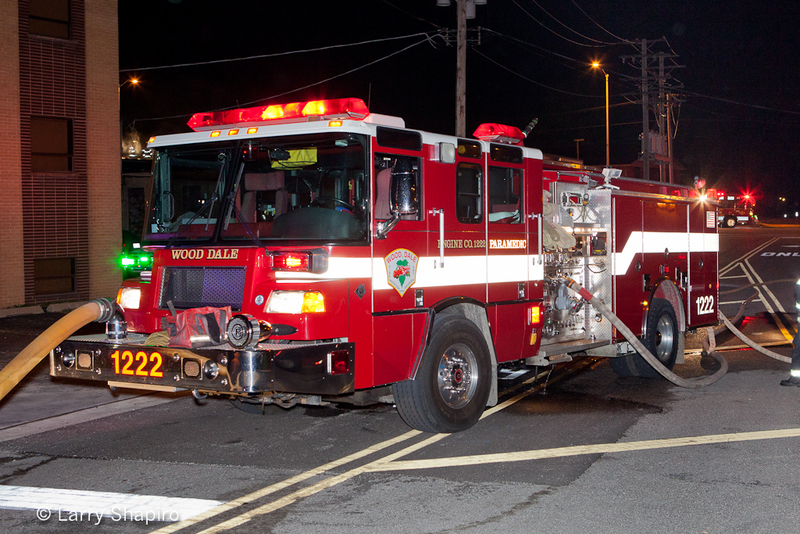 Four others were taken to nearby Advocate Trinity Hospital , while two other crash victims were taken to South Shore Hospital. 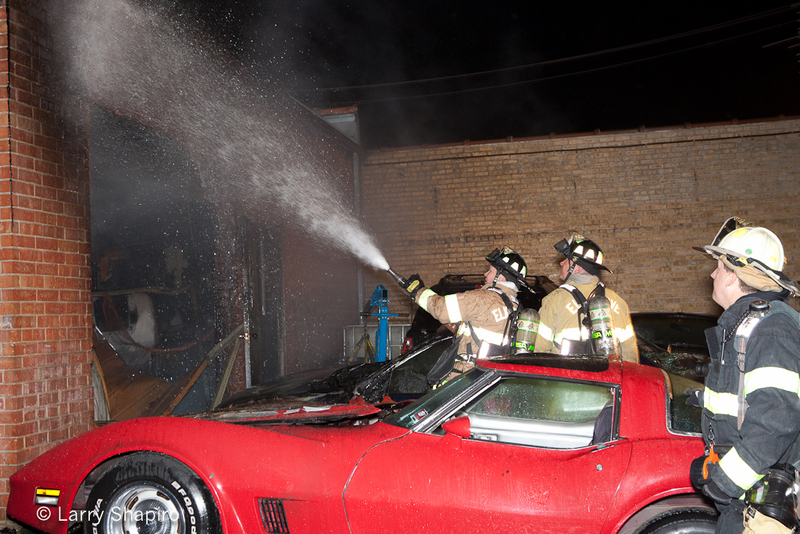 All were listed in fair condition, but authorities said it appeared that no one was seriously hurt.